Working together, the employees and customers of 10 Standard Bank (www.standardbanks.com) branches made the Holiday season a little brighter for Southland non-profit Park Lawn and the people it serves. Their donation of over $5000 will go to the agency’s “Angel Fund,” (http://www.parklawn.com/about_us/programs.html/title/angel-fund) which provides assistance with everyday living expenses as well as specialized equipment for individuals with a wide range of intellectual and developmental disabilities. Donations to the bank’s “Holiday Hope for Park Lawn” program were made by purchasing ornaments to decorate the holiday trees located in each of the ten participating branches. Founded in 1955, Park Lawn offers a variety of programs and services such as vocational and developmental training, residential facilities and supported employment. The agency’s Angel Fund was created to meet the needs that Social Security and other programs don’t cover, and to ensure that all residents and clients feel unique, loved and valued. For more information visit www.parklawn.com. 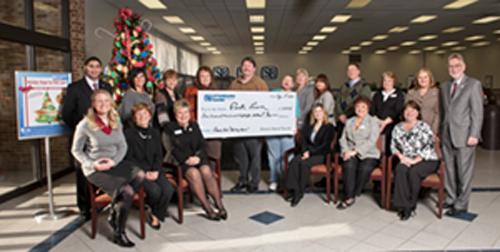 Park Lawn is just one of many community organizations that has benefited from Standard Bank’s tradition of service. With 43 branches in Chicago and Northwest Indiana, the bank’s efforts have supported schools, veterans organizations, food pantries and other organizations in every neighborhood they serve. More information about Standard Bank and its services can be found on their website, www.standardbanks.com.